Ben knew what he had to do, but the sacrifice would be enormous. It had been decades since his “condition” was diagnosed. Unusually dense muscular and connective tissue, bone structure could take tons of stress, he stopped lifting weights when he was sixteen because he couldn’t find gym equipment heavy enough to challenge him. He hadn’t lifted anything really heavy in years. Yes, he could still do it, but after open heart surgery five years ago, the strain would probably blow out the artificial valve. Ben looked back down at her, and the gradually growing pool of blood around her neck. She was about his granddaughter’s age. She’d just gone into the first grade. This child was somebody’s baby. If it were his granddaughter under here and another man was trapped with her who could save her life, he’d want him to do it, no matter what the cost. There must have been something in Ben’s eyes or maybe his voice, because the firefighter started to have faith that this man might be able to do it. The parking lot must have collapsed beneath them because they were in some sort of depression. All of the rescue equipment and personnel were higher up. Ben watched Jose back away several yards. He got his hands above him, pressed against the cement and rebar and pushed. Nothing. No. He could do this. He was just afraid. He’d never see his wife and children again, never see his three grandchildren or the one on the way. All he had to do was sit tight. He’d be free in an hour, and his family wouldn’t have to go through the grief of losing him. Sure, that’s all he had to do, but then the little girl underneath him would be dead. Ben looked down again. Her eyes were fluttering. She whispered something in Spanish, but he couldn’t understand. He pushed again and felt the weight begin to move. Ben had to get a leg under him. The weight was up, maybe two or three inches. Just a little bit more, just a little more. “Son of a…” He heard Jose swear in amazement. The strain was incredible. It was like he had the weight of the world on his back. He had to keep pushing. His heart was pounding. It was hard to breathe. He was light headed. No. He couldn’t pass out yet. Arms. Jose was reaching in, grabbing the girl. There was no time to be gentle. He got ahold of her shirt and dragged her out. Ben’s vision was dimming, but he could see other people, a stretcher, they were carrying her away. Good. It was over. He could rest. The sun must have been behind him, because he could see the shadow of the massive pile of debris he was supporting. It was going to collapse forward. If he stopped now, the girl, the firefighters, they’d all be crushed. He couldn’t stop. Ben had to keep lifting. He had one foot under him, then two. Later, the video and photos would show a type of strength, determination, and valor comparable only to mythic legends or superheroes. He must have been pressing against something sharp because blood was streaming down his arms. Ben was almost upright now. He could save their lives, but he had to keep the momentum going. He couldn’t let up for a second. It was moving up above him, then backward. He was doing it. Finally, with one final, gigantic effort, he pushed it up and back. They were safe. They’d made it up to the ambulances. The last thing Ben saw before the lights went out was Jose Ramirez looking at him. Something in his expression told him the girl was going to make it. It was worth it. He could rest now. Ben’s eyes opened. There was soft light around him. He must be in a hospital. It was a miracle. His heart didn’t blow out on him. He made it. He wasn’t lying down as he supposed at first. He was on his feet. The man talking to him was in uniform, a Marine by the looks of him. “Well, it ain’t Valhalla, but it might as well be. Oh, name’s Fulk, Jeremy Fulk. Pleased to meet you. Ben shook the Marine Corporal’s hand and then noticed they weren’t alone. Benjamin Moses Howard had always been afraid of using his power, not only because people might brand him a freak or expect him to run around in a pair of tights, but because it might kill him, especially after the heart attack. But then again, there are always things in the world worth fighting for; worth dying for. Somewhere on the other side of the veil, a six-year-old girl named Rosa Hernandez would be able to get out of the hospital and go back home to her family, go back to the first grade, and even become friends with his granddaughter. She was worth it. People always are. As Ben got acquainted with the others, he realized that most of the people here weren’t particularly special or unusual. They were everyday people who had been living out their lives when circumstances presented them with a simple choice, to play it safe, or to risk everything to do what’s right. Just everyday heroes who for one moment in eternity, shone with the brilliance of an exploding star. In the end, that’s what any of us are capable of, if we let ourselves. I wrote this for the Sunday Writing Prompt “Super Powers” challenge hosted at Mindlovemisery’s Menagerie. The idea is to use the theme “super powers” as the inspiration for crafting a poem, short story, or other creative work. If you follow the link I put in the body of the story, you’ll find Corporal Jeremy J. Fulk was a real person who died saving two other people during a training exercise at Camp Pendleton, California. There are no shortage of heroes in the world, we just need to know where to look. When I was a kid, one of my favorite Spider-Man stories was when Peter Parker’s Aunt May became sick because, when Peter’s blood was used to give her a transfusion some months previously, it introduced a radioactive particle that now was killing her. Spider-Man, working with scientist Curt Connors, developed a cure, but the radioactive isotope needed was stolen by Doctor Octopus’s gang. In an epic battle underneath the Hudson River, Ton’s of steel and concrete collapse on Spider-Man, but he’s saved by being trapped in a small hollow space. Everyone flees because the roof is damaged and the river water is starting to flood in. Just yards from the canister that can save his Aunt’s life, he is pinned under a weight that only the Thing or the Hulk could budge. Besides that, he’s been on the go for days without sleep and is totally exhausted. Tormented by his Uncle Ben’s death because of his perceived failure, he’s now tortured by the thought that he has also failed his Aunt. 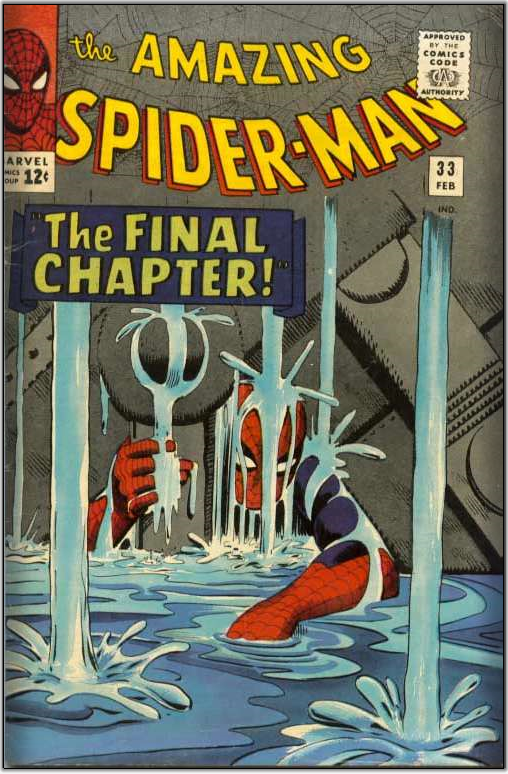 In an enormous demonstration of will and courage, as cascades of water crash down, Spider-Man is able to lift the machinery pinning him and, after another series of adventures, get the isotope to the hospital in time to save his Aunt’s life. Those images have always stuck with me, not just because of the demonstration of superhuman strength, but as an example of self-sacrifice and courage. Peter didn’t die obviously, but the willingness to do whatever it takes to save someone else’s life, is or should be an inspiration to all of us. Most of us won’t ever be put in a position where we have to make a life and death decision, but we all can be heroes in our own small way, making the world a little bit better place by the time we leave than it was when we first entered it. What a moving story, I got chills. She was worth it. People always are.